Home / Caves are Perfect for Winter! Caves are Perfect for Winter! Winter in the Black Hills is just as fun and exciting as the summer months! And while most people head to the ski slopes or go out on a snowmobile there are other outdoor activities for the adventurous type. Although ‘outdoor’ might not be the best term for going caving in the winter. Located south of Custer State Park, Wind Cave National Park is more than just a cave. With more than 50 square miles of wilderness packed full of bison, elk, pronghorn, mule deer, coyotes & prairie dogs you can easily spend an entire day inside the boundary of the park. Once underground however you enter a whole new world. 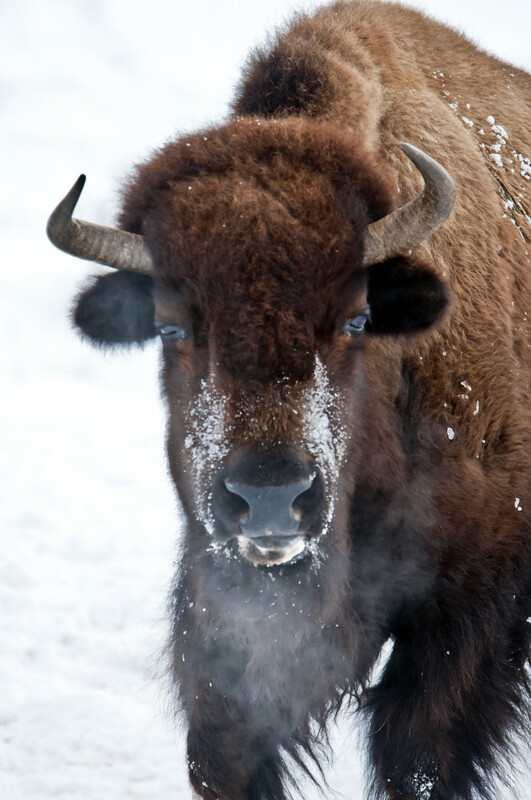 A buffalo exhaling in the cold South Dakota winter. The actual cave at Wind Cave is one of the longest and most complex caves in the world and home to a rare cave formation known as boxwork. Remaining one of the biggest mysteries to geologists, the creation of boxwork in the cave is also its most defining feature. 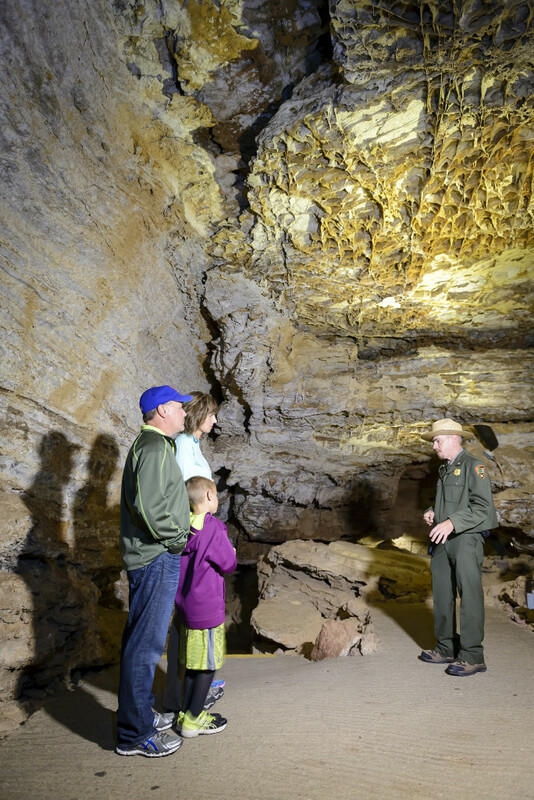 A park ranger shows a family what the boxwork in Wind Cave looks like. Now what makes this cave so fun to visit in the winter is that regardless of how cold it is outside, the temperature of the cave will remain around 54 F/ 11 C all year long. So if your day starts to get snowed out you can head down to the cave and warm up. 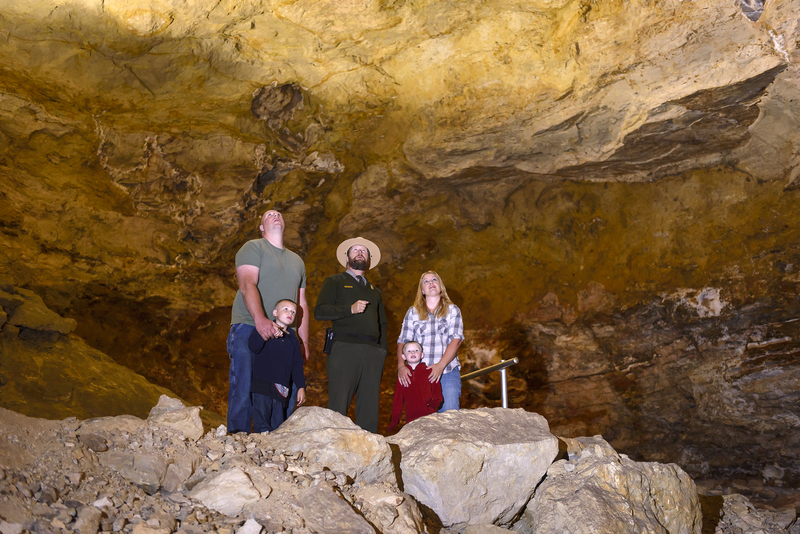 There are guided tours through the cave all year long, but not all are available in the winter so be sure to check their schedule online or give them a call at the park. Northwest of Wind Cave on Highway 16 is Jewel Cave National Monument. Joining the National Park Service in 1933, Jewel Cave has been offering guided tours ever since. Originally a tour of only 2 miles, in 1959 two local rock climbers helped the NPS expand the known areas of Jewel Cave to over 15 miles! The Scenic Overlook in Jewel Cave is one of it's oldest viewing areas. Today tours are offered year round with a special Historic Lantern Tour being offered on in the summer months. 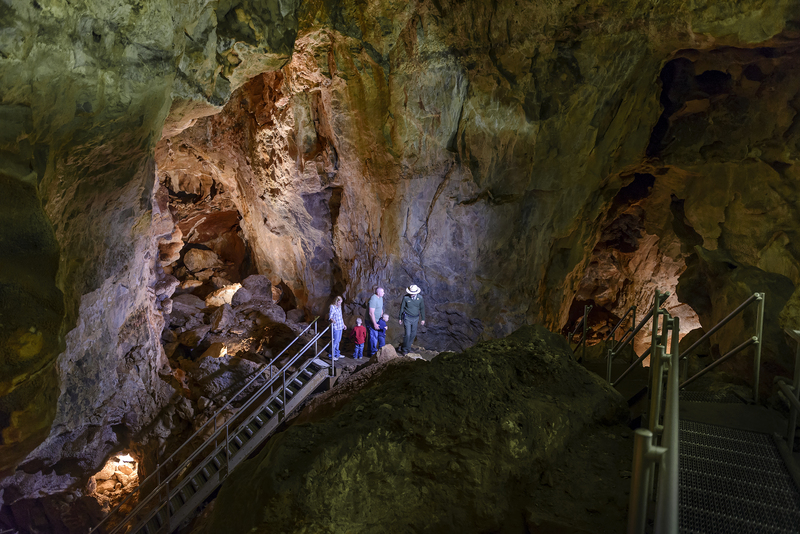 But for you winter explorers, there is still plenty to see with Scenic Tour and reservation only Wild Caving tour taking place all year. Like Wind Cave the temperature stays steady all year and is a pleasant 49 F/ 9 C within Jewel Cave. Park Rangers talk about the formation and geology of the crystals on all of the tours. Getting its name from the blunt nailhead spar crystals lining its wall the story of how Jewel Cave was formed is rather unique. While underground rivers form most caves, Jewel Cave was formed by an acid-rich groundwater slowly circulating beneath the Black Hills. One thing to note, if you plan on tackling the Wild Caving tour be sure you squeeze through their test block out front that measures a meager 8.5” x 24”. The tour lasts 3-4 hours and is extremely strenuous. And any clothes you wear will be permanently stained, so keep that in mind.